Pontiac Metropolitan Stadium was built in 1975 at a cost of roughly $55 million and featured a football capacity of 80,311. Later known as the Pontiac Silverdome, the facility was among the first to incorporate luxury suites into its design. The Michigan Panthers drew the largest USFL crowd of 1983 at the Silverdome, defeating the Oakland Invaders 37-21 in a playoff game before 60,237 home fans. The Panthers' success didn't sit well with the NFL's Lions, who also called the Silverdome home but were nowhere near winning a championship of any kind. When the USFL's owners opted to move to a fall schedule for 1986, however, Panthers owner A. Alfred Taubman had no desire to compete with the Lions and instead merged the team with the Oakland Invaders prior to the 1985 campaign. The Silverdome continued as the home of the Lions through 2001, after which the team moved to a new facility. 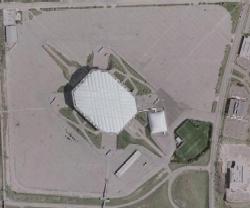 While the building continued to be used periodically, the number of dates the Silverdome was booked for concerts and other events dropped dramatically once the Lions left, and the facility closed in 2004 before reopening briefly again years later. The dome deflated in 2013 and contents of the stadium were sold at auction.